Not feeling any of the new phones to hit the market? 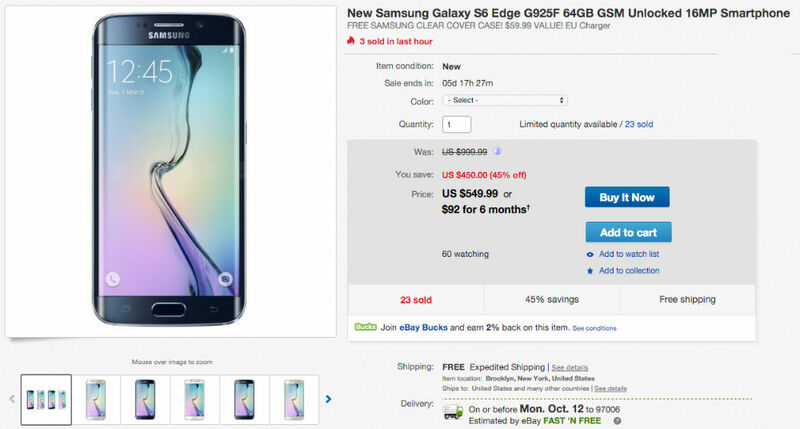 Well, there’s always the Galaxy S6 Edge, featuring one of the best mobile displays and cameras ever put into a smartphone, priced at just $549.99 on eBay. This device launched a few months ago priced at over $700, so grabbing one at a few hundred dollars off is quite the score. This is the international unlocked model of SM-G925F and works great on either AT&T or T-Mobile. This is an unlocked GSM phone, so don’t expect it to work on Verizon or Sprint. The deal only includes the 64GB black model for $550, along with free expedited shipping.